I got a Cisco 7941 off eBay. This is a phone which was £400 when new (some time around 2004) but can now be picked up for about £10. These phones went End Of Sale in January 2010, so even if mine was one of the last phones to roll off the production line it’s still about 7 years old but it’s still working perfectly. A testament to the good build quality of these phones, and perhaps the previous owner’s careful handling. Since these devices are no longer supported many companies will be getting rid of them (or probably already have) so there should be some bargains to be had for phone geeks. Q: Does the Cisco 7941 work with Asterisk? A: Yes. You need to load the SIP firmware (the focus of this post) or chan-sccp (out of scope for this post but I’ll check it out at some point). Q: Does the Cisco 7941 work with SIP? A: Yes. You need to flash the correct firmware though. Q: Is it really hard to get working? A: No. If you’re comfortable with Linux and a few command line tools. And assuming you already have Asterisk set up. Q: Is a lot of the information on the web about how to set up the 7941 wrong? A: Yes. There is a lot of confusion about config files (the 7940 and 7941 use different ones). Q: Will you tell us how you got your phone to work? A: Yes! However – this is what works for me. You will need to tweak the config in places. The phone will download it’s firmware and config via TFTP. It needs to download it’s config on every boot, so you will always need a TFTP server running. I think that if the TFTP server is unavailable it will just use the previous config, so it’s possible that you can get away without it, but I haven’t tried. My recommendation is that you install dnsmasq. It’s a small and full featured DNS server which also includes a DHCP & TFTP server which are easy to configure and it’s almost certainly packaged for your distro. You should also (temporarily) disable any other DHCP servers on your local network so that dnsmasq is the only thing offering DHCP addresses. This will simplify the process of getting the phone to find the TFTP server, since with dnsmasq it will all be automatic. If you later re-enable your original DHCP server, say on your router, then you will need to configure it to give out the address of the dnsmasq TFTP server and disable DHCP on dnsmasq. In my opinion, if you’re going to be running a Cisco IP phone on your network you’d be better off moving all DHCP to dnsmasq. Usually Cisco require a valid support contract before you can download anything useful from their website, but it seems that since these phones are now out of support they have offered up the firmware free of charge. You do still need to register an account to download the files. At the time of writing the latest version is 9.4.2 SR 3 dated 14th February 2017 – so bang up to date, even though these phones are end-of-life. Bizarre, but good for us. Thanks Cisco! Follow the link to the SIP software. This is everything you need to reflash your phone to the latest SIP firmware. Now you need to get the phone to reboot in to firmware download mode. Unplug the phone from the power. Make sure that the network cable is still connected (unless you’re using using PoE). When the line lights are flashing type 123456789*0# This will start firmware download mode. The phone will reboot once download is complete and present you with an “Unprovisioned” message on the screen. This is good news! The phone firmware has now been updated. I put together a video showing this process. It’s not very interesting but it will give you an idea of what to expect. The actual downloading of the firmware section has been sped up 3X. Now you need to configure the SIP extension in Asterisk. Do this as per any other SIP extension, but bear this important piece of information in mind: The Cisco 7941 can only deal with 8 character passwords, so keep your SIP authentication secret to 8 characters. RTP Port range, start and end. Please take the time to read this section fully, this is the part that is most troublesome. The Cisco 7941 is very picky about it’s config file and even a small mistake will stop the phone from working. These settings are specific to the 79×1 series of phones running at least version 8.x of the firmware. If your phone is not a 79×1 and/or is not running v9.x.x of the firmware then these settings are not for you. Once the phone has loaded it’s firmware and booted, it will go looking for a file called SEP<PHONE MAC ADDRESS>.cnf.xml. So if the MAC address of your phone is 11:22:33:44:55:66 then the config file needs to be named SEP112233445566.cnf.xml. This file needs to be in the root of your TFTP server. You will see mention of a file called XMLDefault.cnf.xml. If you’ve only got a few phones, don’t worry about this, you don’t need it. Note that this config file has two lines configured. If you just blindly search and replace you’ll end up with two extensions configured the same. ipAddressMode – 0 is IP v4 only. But this seems to have little effect. registerWithProxy – true – Registers the device with Asterisk, this allows incoming calls to be sent to the phone. If you’re getting “Unregistered” message on the screen, check you have this set. networkLocale – United_Kingdom – sets the tones to UK, see the optional extras section for more info. dialToneSettings – 2 is “always use internal dialtone”. See option extras for more info. Edit this file as necessary and then save it to the root of your TFTP server with the filename: SEP<MAC>.cnf.xml. If your phone MAC address was aa:bb:33:44:55:66 then the filename would be: SEPAABB33445566.cnf.xml Note that it’s case sensitive, letters in the MAC address should be in upper case the extensions should be in lowercase. You can get the MAC address for the phone from the syslog on your dnsmasq server. If your phone is still in “Unprovisioned” mode it will have been asking for this config file repeatedly. Once you save the file you should see the phone reboot shortly afterwards. It may download the firmware again for some reason, just leave it to get on with it. From these logs you should be able to tell if the phone has loaded your config correctly. Errors about “updating locale” or “no trust list installed” can be ignored. If there is a problem with the config file itself a generic error will be listed here. If the phone won’t load the config file the most likely reason is that there is a typo in your XML file. Good luck finding it. You can SSH in to the phone to get more detailed logs and debugging information, but I haven’t tried this yet. Google is your friend. Save this to the root of your TFTP server, named “dialplan.xml” (lowercase). Filenames are case sensitive. Once you’ve save this file, copy it to “distinctiveringlist.xml” as well. This will allow you to set ring tones for the default ringer and different rings for each line. The phone comes with a single default wallpaper with horizontal lines on it. This is easily replaced by your own designs with a simple PNG. Create a directory in the root of the TFTP server called Desktops. In here create another directory called 320x196x4. You will have noticed that the phone has a “Directories” button and a “Services” button. I haven’t managed to add an extra phone book to the Directories button yet although I think it’s certainly possible, just that the XML file refuses to do anything. However, I have got a phone directory working on the Services button. Important note: You must tell Apache to serve those files as type “text/xml“. “application/xml” will not work. Watch /var/log/syslog on the machine running the TFTP server. You’ll be able to see exactly what files the phone is asking for. Bear in mind that it does ask for files it doesn’t strictly need, so don’t worry too much about file not found errors unless it’s one of the above. Are you using SIP or PJSIP, not sure what difference is but my LG SIP phone wont work on SIP as port is different (5061) PJSIP uses 5060 and works… somewhat on the LG, by that I mean incoming is great outgoing is silent for a random amount of time then it works great. so hence digging up the cisco (looks nicer imo too) but my current problem is no matter if I make an extension PJSIP or SIP it still gets stuck at registering on the phone. I read somewhere that the 7941 always tries to connect to the highest numbered SIP port regardless of what you tell it. So my guess (and it is only a guess) is that it’s trying to connect using encryption when there is none. Hence why you’re not seeing any attempts to connect, because the encryption handshake is failing. Hey Will, thank you so much for this article. I am working now for almost one year (time to time) to get my CIsco 7961 working. I tried almost all configurations you can find on the internet. I got to a point where I could receive calls but not place them. Thanks to you it is now working. So I can confirm that it works for Cisco 7961, too. What version of Asterisk or FreePBX is recommended? I dont think you need a specific version. I’d say use whatever is packaged for your distro, or the latest upstream version. Do you know of any major differences between the 79×1 models and 79×2 models? I am trying to get a 7942 and 7962 working with Switchvox, and having problems at the SIP OPTIONS stage. 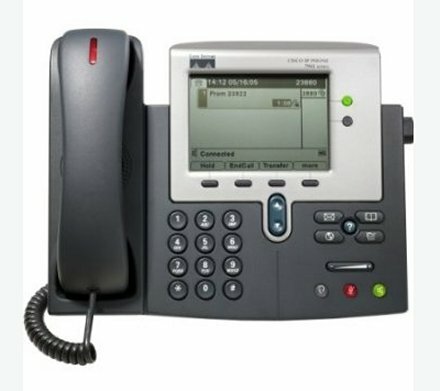 We bought CISCO7941 phones from ebay and I migrated couple of phones to our network with factory reset. Phones are migrated to our network. Phone is loading SEPMAC.cnf.xml and shows the configured users and phone show registering or “Enregistration” . Phone is sending SIP registration request to our server frequenetly though SIP server respondes with 200 OK. Phone also sending Reason header in SIP register request. Below are the traces. Can you please review and suggest how to solve the issue from phone? Date: Mon, 16 Jan 2017 09:07:00 GMT. Reason: SIP;cause=200;text=”cisco-alarm:14 Name=SEP002155043E14 Load=SIP41.9-4-2SR3-1S Last=cm-closed-tcp”. Just got one from ebay about 12 pounds. Updated to latest firware from Cisco and tried every configuration found here or other blogs and site. I have installed asterisk local and TFTP server success. I am one step to give it away for recycling. Is there anyone who can help me to configure it to my Asterisk local server? I can give you some Teamviewer access to work directly. I am trying to register a cisco IP 7941G phone with an asterisk server and then upload the firmware version .8-5-4 phone work. Now I can take calls but I can not route incoming calls to the IP phone because the attachment is not registered on the plant. Do you have to modify any additional parameters in the SEP .cnf.xml file to make the IP phone register with the plant to be able to assign calls? i’ve Cisco 7960 IP Phone setup, I managed to get phone registered and got a dial tone but whenever I try to place an outgoing call it just wouldn’t call out. In addition to that, I’ve that little X next to the extension on line 1, could this be cause of my issue? The little X indicates (I think) that the phone hasn’t correctly registered with Asterisk. The dial tone is being generated from the phone itself, not Asterisk, so that could well be a red herring. I’d suggest turning up the logging on Asterisk to the max and switching on SIP debugging. This could be something as simple as a port number or password. Thank you for great the guide. Following I managed to get a 7961g working with freepbx. I am in Toronto,Canada. I can make and receive local (10 digits) only remaining issue is that I can’t make any international calls (I am able to make the same international calls from other extentions connected to my freepbx) . I suspect that it’s an issue with the dialplan.xml. Any suggestions would be greatly appreciated. Thanks . Hey, whenever I add a second sip line, the phone keeps restarting. NOT 15:03:16.253352 JVM: Startup Module Loader|cip.sipcc.d: – initializeLinePlane(): Mgmt Interface is in Service now..
One key thing is that each sip account is different and they both use different ports 5063 and 5062 but the server is the same, matching the settings on the server for each line. I did try and put them both on the same port, but that didn’t work either. Everything works if I just use one or the other. Any ideas? Mr. WILL COOKE please i need your help i have Cisco Phone and its firmware SIP and i want to change it to SCCP can you help me please ? Thanks for this post, it helped me after countless hours of trying to get 7961G running. Weird thing though, the phone registered to a VoIP provider only when I set the transport protocol to TCP. UDP just didn’t work. I spoke with the provider and they told me I’m rejecting the UDP packets coming back from them. So I’ve tried to forward ports, even putting the phone to DMZ, no luck. Maybe there are more settings related to using UDP? Post up a LTC or BTC address so I can buy you a beer. You saved me hours. I needed to use CHAN_SIP, not PJSIP. Finally got my Cisco 7941G working with my freePBX. I was wondering if it supports a login feature like example. User can go to any phone and login to their ext? It’s since July that I try to register my Cisco 7961G on Asterisk, but I can not. I’ve read the post so many times, but I can not. I have the sip firmware 9.4.2sr3.1s and asterisk 15.4.0 FreePBX 14.0.3.19. I’m using sepmac.cnf.xml of the copied from this post. Who managed to run the cisco 7961g, can send me the configuration. I have set up a phone server with FreePBX and Asterisk on a Raspberry PI3+ (i’m using raspbx distro, a complete system) and I have my phones to work with SCCP. I have also set up a phone directory made with PHP. It fetches all phone numbers from the systems MySQL-database, so I don’t need to add entries manually. So, if I create a new extension, then it will show up in the phonedirectory.